Need a New Year's Resolution? How about a healthier, more beautiful smile? 2016 is almost here, and it’s a great time of year to get started on achieving a straight, dazzling and confident smile that will last you a lifetime. At Prose Orthodontics, we are proud to offer some of today’s most innovative orthodontic technologies that can straighten your smile in less time than you ever imagined. Not only do today’s braces and other orthodontic treatments straighten your teeth quicker, they also offer greater comfort for you, and require fewer visits to our office. So if obtaining a healthy, beautiful smile is one of your New Year’s resolutions, we invite you to give us a call to schedule an initial orthodontic consultation. Happy holidays from all of us at Prose Orthodontics! Can Prose Orthodontics add your smile to the timeline? Prose Orthodontics wants to remind our patients with braces to put some thought into the treats you will be eating this Halloween. We want our patients with braces to enjoy the holiday and not feel that they are missing out. They can choose among the many treats that are brace friendly, avoiding ones that are hard, sticky, gummy, or chewy. Please remember that sweets can cause cavities, which means brushing and flossing are more important than ever during the Halloween season. Please take extra time to brush and floss after indulging in your sweet treats. The beautiful smile that is in your future will be much sweeter than the momentary pleasure from candy that can damage your braces or teeth. 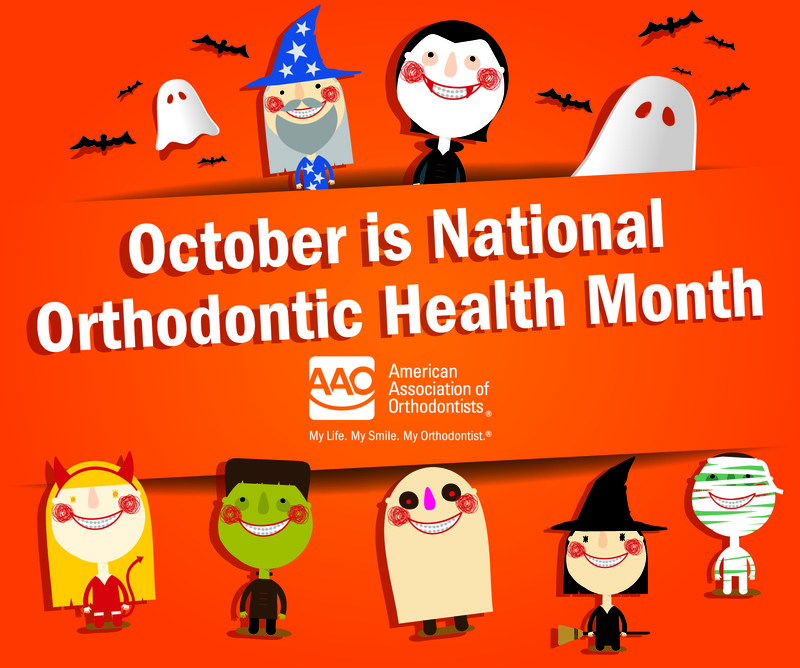 National Orthodontic Health Month is also an opportunity for us to remind everyone of the positive impact orthodontic care can have. Regardless of your age, orthodontics can improve how you look and also have a positive impact on your health. Prose Orthodontics has many treatment options available including metal braces, clear braces, Invisalign, and Invisalign Teen. Your complimentary consultation will give you an opportunity to see our office, meet our team, and find out about your treatment options and our affordable treatment plans. Give yourself the confidence of a great smile with Invisalign. Invisalign treatment takes a modern approach to straightening teeth, using a custom-made series of aligners created for you and only you. These aligners are made of smooth, comfortable, and virtually invisible plastic that you simply wear over your teeth. Wearing the aligners will gradually and gently shift your teeth into place, based on the exact movements Dr. Prose plans out for you. There are no metal brackets to attach and no wires to tighten. You simply pop in a new set of aligners approximately every 2 weeks, until your treatment is complete and you achieve the confident smile that you've always wanted. Invisalign treatment won't interfere with your daily life and most people won't even know you're straightening your teeth. You've waited long enough. It's your turn to smile! Are you a candidate for AcceleDent Aura? New breakthroughs in orthodontic technology offer patients accelerated treatment options. Prose Orthodontics prides itself in offering you the very latest, proven, safe and effective methods for optimal orthodontic care. We offer AcceleDent Aura, a new, simple, hands-free device to help your orthodontic treatment work faster! Ask us if AcceleDent Aura is right for you! Whether you're considering clear aligners or traditional braces, an orthodontist has the training, experience, and treatment options to make sure you get your best smile. A dentist is similar to your family doctor - great for check ups and filling cavities. Dr. Prose is a specialist who has 2 to 3 years of additional education, is an expert in straightening your teeth, and will work with you to make the best decision - for your best smile. Please visit www.proseorthodontics.com for more information. What can you tell me about the Damon Bracket? Damon Braces are a type of braces that use advanced shape memory wire and tie-less brackets to move your teeth into position without tightening. The treatment time is generally 6 months faster than traditional braces. There’s never headgear involved, and, in most cases, you won’t need to have any teeth pulled. The days of having braces tightened are over. That’s because Damon System braces have a unique slide mechanism that allows your doctor to use far lighter forces to move teeth to their correct positions. So not only is your treatment shorter, it is also far more comfortable. Many people experience little to no discomfort in treatment. What makes Damon braces different?